1. Which one of the following statements is not correct? 6. 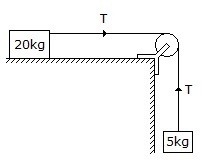 A block of mass 20 kg lying on a rough horizontal plane is connected by a light string passing over a smooth pulley to another mass 5 kg, which can move freely in the Vertical direction, as shown in the below figure. The tension in the string will ___________ with the increase in coefficient of friction. 7. Coplanar non-concurrent forces are those forces which __________ at one point, but their lines of action lie on the same plane. 8. Which of the following do not have identical dimensions? 10. A framed structure is perfect, if the number of members are __________ (2j - 3), where j is the number of joints. 14. If n = number of members and y = number of joints, then for a perfect frame, n = ? 15. A framed structure is imperfect, if the numbers of members are __________ (2j - 3).